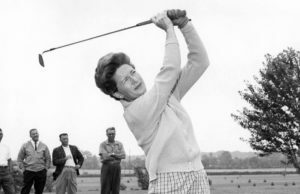 Marilynn Smith, one of the 13 founders of the LPGA, died on Tuesday, four days before her 90th birthday. A native of Kansas, Smith was introduced to the game by her father, who as punishment for a tantrum she threw following a bad day of softball took her out to Wichita Country Club. She’d shine at golf fairly fast. At just 17 she won the 1946 Kansas Women’s Amateur for the first of three times. She attended the University of Kansas and won the women’s NCAA Championship in 1949, then turned professional. in 1949, she’d join the failing Women’s Professional Golf Association.